FILE - President Hassan Rouhani visits the Bushehr nuclear power plant just outside the port city of Bushehr, Iran, Jan. 13, 2015, in this photo released by the Iranian Presidency Office. 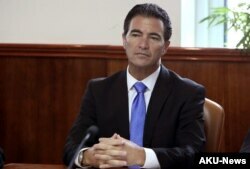 FILE - Israel's new head of Mossad, Yossi Cohen, attends the weekly cabinet meeting at his office in Jerusalem, Jan. 10, 2016. "As head of the Mossad, I am 100 percent certain that Iran has never abandoned its military nuclear vision for a single instant. This deal enables Iran to achieve that vision," Cohen said. "That is why I believe the deal must be completely changed or scrapped. The failure to do so would be a grave threat to Israel's security." His analysis aligns closely with that of Prime Minister Benjamin Netanyahu at a time the Israeli leader is hopeful that U.S. President Donald Trump can negotiate changes to the deal. The issue has sparked some debate inside Israel's security community, with some voices pointing to positive aspects of the deal in that it has delayed Iran's nuclear development. Israel and Iran are arch enemies, and Israel has identified Iran as its top threat, citing the nuclear program, its hostile rhetoric, support for anti-Israel militant groups and its development of long-range missiles. Yet other officials, both active and former, have taken a more nuanced approach by focusing on the positive aspects of the deal. In a recent interview, Lt. Gen. Gadi Eisenkot told the Haaretz newspaper that he knows of no violations of the nuclear deal by Iran, though he said Israel is closely watching and assuming Iran can operate secretly.